1. 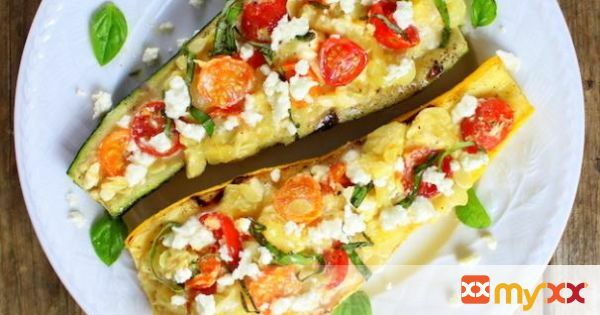 Cut the zucchini and squash in half. Using a sharp knife cut around the inside edge of the squash. Next make horizontal slits across the squash, from one side to the other of the lengthwise cut. 2. Use a spoon to carve out the center of each zucchini and squash, so they look like little boats. Reserve the center pieces. 3. Season squash with salt and pepper, and dust with cooking spray on the zucchini. Heat grill to 450 degrees and grill for 4 minutes per side. 6. Chiffonade the basil leaves (aka cut into long thin strips), sprinkle on the zucchini boats, and serve.